California's population was at about 37,691,912 profoundly weird human beings as of last July, meaning it makes up roughly 12% of the entire population of the United States. If you're one of these 12% you can buy yourself a Fiat 500E electric car. The rest of you can fuggedaboutit because Fiat won't sell you one anywhere else. that automakers sell a certain number of EVs. These are "compliance cars" like the RAV4 EV and Smart EV, which tend to get dumped into fleet programs. 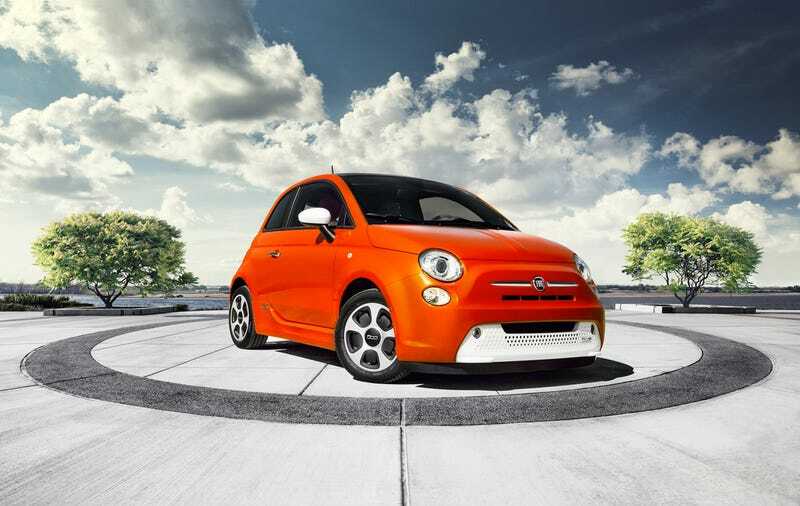 The Fiat 500E is a compliance car, but it least it's a somewhat interesting one, producing a decent 111 horsepower and 147 lb-ft of electronically instantaneous torque. This helps propel the like car to 60 MPH in the low nine-second range, besting the non-Abarth models. Range is 80 miles standard, but it can travel more than 100 miles during city driving. Charge time (these are the stats we care about with electric cars) is down to four hours with a Level 2 charger, so expect the typical 8 hours if you're doing it the old-fashioned way. The images you see above are of the "e-Sport package" which adds Abarth-like touches including blacked-out lamps, staggered 15-inch aluminum wheels, and larger brakes. Fiat says this will be the first EV that will fun to drive (excluding all those Teslas, we suppose) and that it'll carry over the tossable characteristics of the regular 500 despite what we expect is added weight. It could be fun, but there's a good chance you're not getting it even if you wanted one.